*ATTENTION: This file is also included in Stretching My Mind with Concept Circles BUNDLE. The bundled product includes concept circles for beginning letters sounds, beginning, blends, beginning digraphs, shapes, colors, holidays, and more miscellaneous categories. You can save 20% when you purchase BOTH products bundled together. 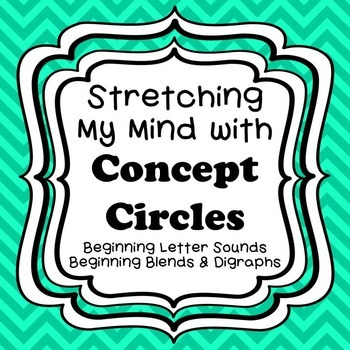 Check out the BUNDLED product here: Stretching My Mind with Concept Circles BUNDLE. This packet includes 41 pages of concept circles. Show your students a concept circle. 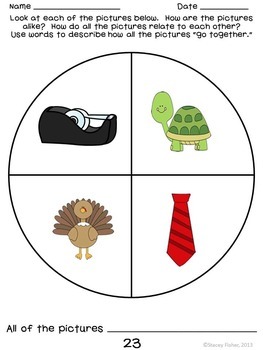 Each concept circle contains four pictures that have something in common. Have the students try to determine how the pictures relate to each other? What is the main idea? Concept circles are a great way to build creative thinking skills, introduce a topic, review skills, and more! Concept circles can be a great hook for your lessons or a fun time filler. 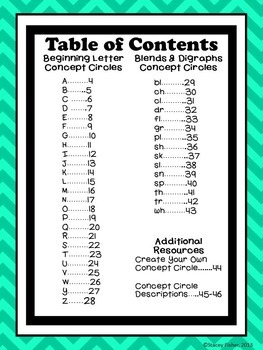 This packet includes concept circles focused on beginning letter sounds. There is a concept circle for each letter of the alphabet (except X) and for 15 different blends and digraphs. 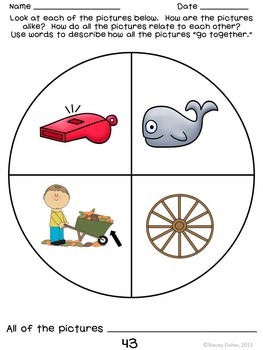 Each concept circle contains pictures of 4 objects that have the same beginning letter or the same beginning blend or digraph. The blends and digraphs include: bl, ch, cl, dr, fl, gr, pl, sh, sk, sl, sn, sp, th, tr, and wh. The packet also includes an open-ended worksheet where students can select a concept, draw four pictures that pertain to that concept, and have their peers try to guess the concept. There are descriptions of each concept circle included at the end of the packet. The descriptions tell the name of each object, so you can accurately name each object. Check out the preview for a better look. If you have any questions, please feel free to contact me! •	Please go to your My Purchases page (you may need to login). Beside each purchase you'll see a Provide Feedback button. Simply click it and you will be taken to a page where you can give a quick rating and leave a short comment for the product. You earn TPT credits for leaving feedback on paid items! I’d also love to know what you thought about this resource!